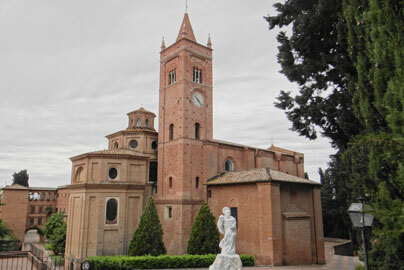 Sant’Antimo Abbey is unique as it is one of the most significant examples of Romanesque architecture, inspired by Lombard and transalpine artistic traditions. 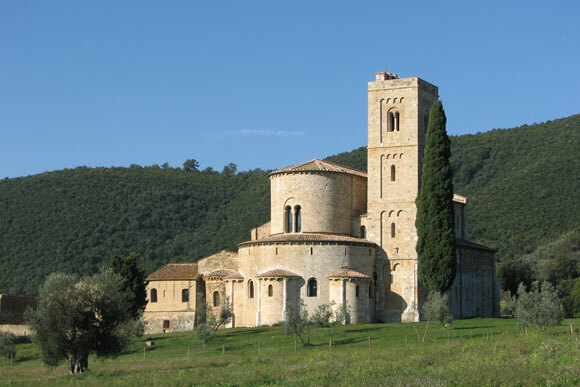 It is a monastery built between the eleventh and twelfth centuries, whose magnificence is enhanced by the surroundings – the pleasant valley of the Starcia river, dotted with olive trees. 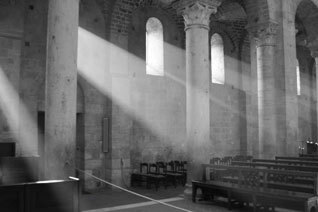 According to tradition, the abbey was erected along the Via Francigena at the behest of Charles the Great, yet there are no documents to confirm this. 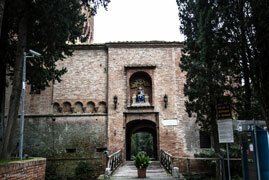 The emperor may have brought the relics of the holy martyrs Antimo and Sebastiano, received by Pope Adrian the First, donating it to the Abbey. The first mention of the church dates back to 814, however, when Louis the Pious succeeded to Charlemagne, his father. It was originally a powerful Benedictine abbey, yet this power declined from 1202 due to disagreements with Siena’s government. 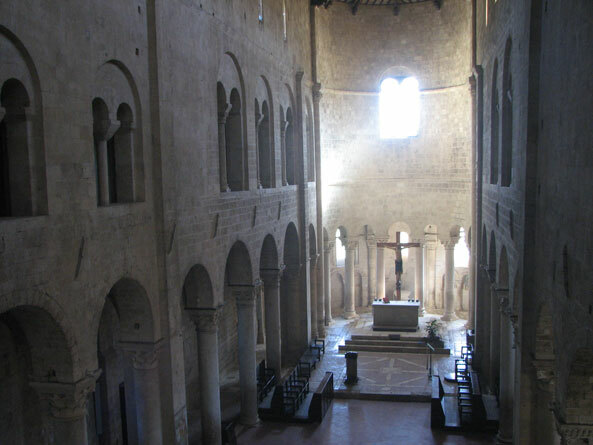 In 1291 the Abbey was donated to the Guglielmites by Pope Nicholas V, while in 1462 it was suppressed by Enea Silvio Piccolomini (Pius II) and annexed to Montalcino, which became a diocese thanks to its annexation of the Abbey. In the eighteenth century the church was reduced to a simple oratory with occluded aisles. In the twentieth century it has passed down to the Italian state, to which it still belongs. 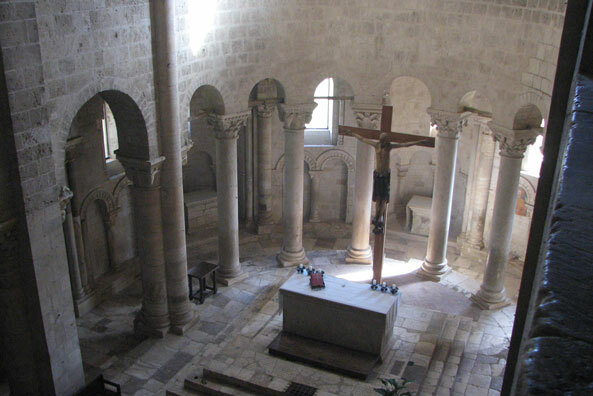 Only recently has it re-gained its role of important spiritual centre thanks to the efforts of a Regular Pre-monstratensian community, who settled in this sacred place in 1992. The Abbey’s structure reflects the classic setting of Benedictine abbeys: an impressive church, a large cloister and one or more small cloisters, a capitulate room and a refectory. The Abbey of Monte Oliveto Maggiore also has a great library. The cathedral was built between the fourteenth and fifteenth centuries. Like many of Siena’s churches of the period, the Cathedral is a veritable museum of sacred art, where in addition to beautiful paintings visitors can admire statues, inlaid works – such as the choir lectern by Fra Raffaele da Brescia – or artistic windows on the walls. The Great Cloister is open for visits. 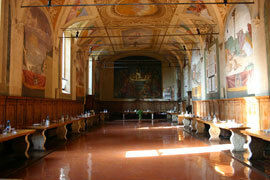 Each niche is frescoed with paintings by Luca Signorelli and Antonio Bazzi, called the ‘Sodoma’. Overall, the Signorelli and Sodoma have painted 35 large frescoes representing the major moments of St. Benedict’s life. This cycle of frescoes on St. Benedict’s life is perhaps the most remarkable and complete among those visible in Italy. The large Cloister leads to the Refectory on the ground floor, and up the stairs visitors come to the Great Library and capitulate room – nowadays, an arts gallery.